Centrochelys sulcata is the third-largest species of tortoise in the world after the Galapagos tortoise and Aldabra giant tortoise and the largest of the mainland tortoises. 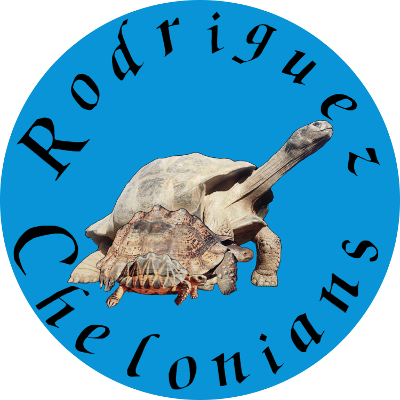 Centrochelys sulcata have broad, flattened carapaces, evenly brownish or yellowish in color. As they age, the growth rings inches on each of the scutes are strongly marked. The skin on the legs is well blended into the shell color. Well-defined spurs are present on the front of the front legs which are used for protection from predators and on back of the rear legs which serve no observable function. An open air tortoise table is preferred as opposed to a closed vivarium or glass tank to provided proper ventilation for hatchlings and juveniles. We recommend a table no smaller than 1.2 x 0.9 meters (4 x 3 feet) with at least 0.3 meters (1 foot) high walls to allow a good temperature gradient. Subadults and adults can be housed outdoors given proper heat, shelter and predator protection. The bigger the space the better especially as a large adult. A full size adult tortoise should have at least a 120 square meters (400 square feet) of space to roam. Providing a tortoise house when kept outdoors will prevent your tortoise from digging a burrow and possibly escaping. A hide box provides a safe place for your tortoise to sleep at night and should be kept warm and humid. They can be purchased or made from a plastic container. Either way it should be dark to allow the tortoise to feel safe. Fine coconut coir or peat moss both provide a good moisture retaining substrate for smooth shell growth. The soil should be at least 0.05 meters (0.16 feet) deep to allow the tortoise to dig down. UVB is necessary for proper growth and calcium absorption. We use Zoo Med Reptisun T5 lights. They should also be changed out every six month to assure proper UV output. You can buy a UV meter to monitor the life of your light. Natural sunlight is a great source of UVB, however exposure must be done safely. Young tortoises must be watched closely while outside due to risk of predators and overheating. They should never be left unattended and you should provide for them an area with shade and water. We recommend only a couple hours outside and soaking after being brought back inside. Young tortoises spend most of their day hiding in the wild for safety. Proper heat and temperature is extremely important in tortoise care. There are several factors to consider and methods to provide heat. The first of which is a mercury vapor bulb which provides heat and UV light. These lights can be hung above the tortoise table or clamped to provide a hot spot in the enclosure. A hotspot of 35-38 °C (95-100 °F) is recommended. The next heating option is an infrared light which can be used for night to provide a warm hide for your tortoise to sleep. Another option to provide a warm hide to sleep is a flex watt heat mat on a thermostat, although some have a build in thermostat. When using a heat mat under the enclosure to provide belly heat proper insulation is also important for safety. All tortoise tables should allow a heat gradient from 24-29 °C (75-85 °F) with a hot spot around 38 °C (100 °F). This will allow the tortoise to thermoregulate as needed throughout the day. One of the best investments you can make is an infrared temperature gun to monitor the actual substrate temperatures where your tortoise is sitting. If the ambient room temperature is too cool you may need to cover a portion of the table to trap to the heat and humidity. Just remember to allow proper ventilation. Fresh water should be provided daily in a safe shallow, size appropriate dish. Often commercial tortoise water dishes are too deep for a hatchling. It’s better to use a shallow lid until they are bigger then the water dish size can be increased with the animal’s size accordingly. Besides access to water in the table hatchling and juveniles should be soaked daily in a draft free area with shallow water around 32 °C (90 °F) for 10-15 min. Hatchlings require humidity of 60-80%. To keep the humidity up in your tortoise table keep the substrate moist but not wet, especially on the warm side of the tank. Also providing a warm humid hide for your tortoise to sleep in will provide proper humidity. Keeping a hygrometer in the table makes it easy to monitor the humidity level. Centrochelys sulcata are grassland grazers. Therefore grass, weeds, leaves, flowers and hay are the best foods for them. Orchard or Bermuda hay are good options because they are a grass hay and low in protein. Many plants and flowers are safe for the tortoises but they need to be pesticide free. The diet should include a good calcium source to prevent metabolic bone disease. A great natural source of calcium is spineless cactus but you can also use calcium powder, cuttlebone or Mazuri tortoise diet. Cactus, while extremely good for them, should only be fed a couple times a week due to its laxative effect. 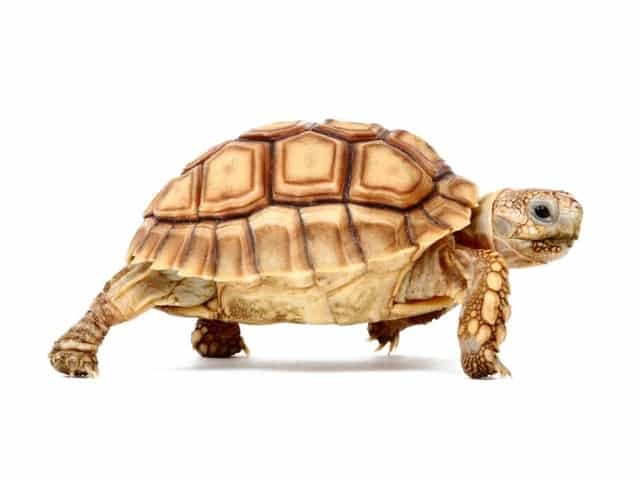 Hatchlings and young Centrochelys sulcata could become stressed by over handling so it’s a good idea to keep sessions short until they get used to you. It’s also good to be gentle when handling or moving them and always give them support underneath and on all four legs. As they become older they will associate you with food and generally become friendly and may even like being pet. The enclosure should be spot cleaned daily and the substrate changed out as needed. If a deep cleaning is required the animals should be kept away from harsh chemicals and everything rinsed well. Centrochelys sulcata can be affected by an array of health problems. The most common are respiratory disease, parasites, and calcium deficiency causing metabolic bone disease. All of which can be avoided with proper husbandry. Excessive moisture without heat, general lack of heat, lack of UVB and dehydration are common oversights that can be detrimental to tortoises health.